This walk: 2015-2-4. "Two Bridges Tor", West Dart River, Wistman's Wood, Longaford Tor, Littaford Tors, Crockern Farm, robin, Crow Tor, Beardown Tors, Devonport Leat. "Two Bridges Tor" - this granite formation in the car park opposite the Two Bridges Hotel is said to illustrate how the tors of Dartmoor were formed. The rock is eroded underground. The hypothesis being that the rain-water was acidic, further enhanced by the soils, causing the erosion of weaknesses in the rock to form horizontal and vertical joints, leaving them filled with soft growan. The growan becomes removed in geological time as the nascent tor becomes exposed to the atmosphere by the erosion of the overlying soils. Source: Ken Ringwood, Dartmoor's Tor and Rocks, University of Plymouth Press, 2013, page 9. Click on the image to see a larger version. Looking back to the modern road bridge over the West Dart River. Looking at Crockern Farm, behind the trees. Looking into the trees - a truly rocky place! Wistman's Wood is one of three relict oak woods on Dartmoor - the most northern one is Black-a-tor Copse (or Black Tor Beare, on the West Okement River, running into Meldon Reservoir), where the trees are not as tall as here; this one - Wistman's Wood; and Piles Copse beside the River Erme on south Dartmoor, where the trees are taller than in Wistman's Wood. These trees are apparently pedunculate oak, leading to the argument that sessile oak has replaced much of the pedunculate oak in the south-west (Source: The Broadleaved Woodland of Dartmoor). View down to the West Dart River. The Tor Master, beaten by a snowman?! A famous view where the Devonport Leat, running from right to left through the middle of this photograph, appears to run uphill! Beardown Tor is on the sky line. Returning to Two Bridges by a higher path. A machine at rest beside the Devonport Leat. Crockern Tor, SX 616 758, elevation 400 metres (1312 feet). Coming back off the hill onto the icy track. 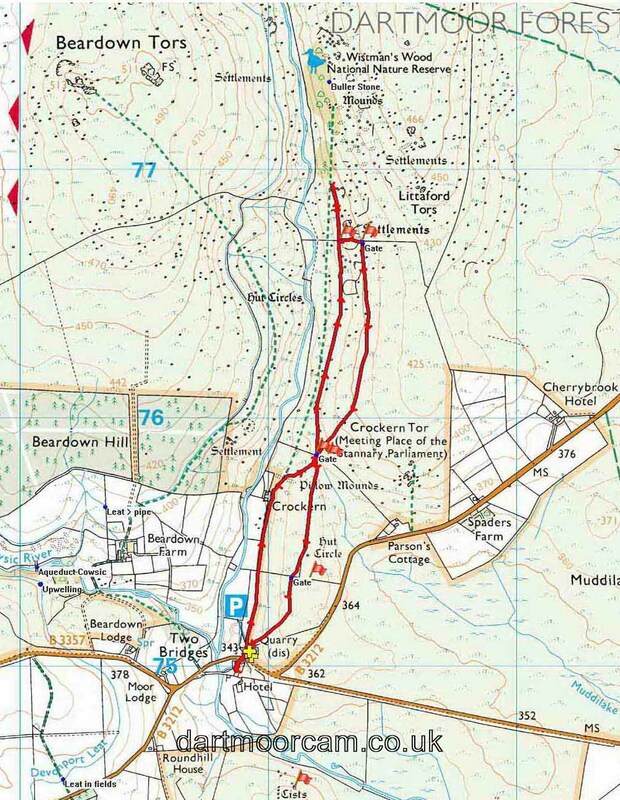 This walk was reached by following the B3212 from Princetown and parking in the quarry opposite the Two Bridges Hotel, at the yellow cross/ P symbol on the map. Distance - 4.58 km / 2.85 miles.